Two people were reportedly flown from the scene of this accident on U.S. Route 50 in Highland County near the Brown County line. One the vehicles damaged in a Kroger parking lot accident is shown. The trail of drying material shows the partial path of the vehicle that caused the accident. 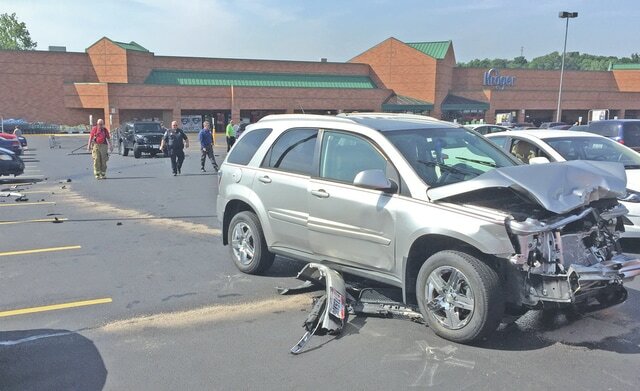 Two people were reportedly flown from the scene of one accident and an elderly man damaged five vehicles in the Kroger parking lot among three accidents handled by local emergency personnel Thursday morning. The most serious accident may have took place on U.S. Route 50 around noon in Highland County near the Brown County line. A van traveled off the road, snapped a utility pole and ended up on its top off the road. According to scanner traffic, two people were flown by helicopter from the scene of that accident. But the Ohio State Highway Patrol Wilmington Post, which was investigating the accident, said numerous times Thursday that no further information was available. A more unusual accident took place in the Kroger parking lot in Hillsboro. According to reports from both the Hillsboro Police Department and Paint Creek Joint EMS/Fire District, 96-year-old Charles Dawson, of Hillsboro, damaged four vehicles, plus his own vehicle and a cart corral, in an accident scattered across three parking aisles. Dawson lost control of his vehicle after pulling into the parking lot at 10:16 a.m. He sideswiped one car, traveled across two more parking aisles demolishing a car corral and pushing a Jeep from its parking lot out into a driving lane, bounced off another vehicle, then headed toward the fuel station and tore the front end off of a minivan, emergency responders said. The police department said Dawson said he got a cramp in his leg. All four of the other vehicles were parked and unoccupied. The police department said two of them were probably totaled. Dawson received minor injuries, likely from his vehicle’s airbag, the police department said, and was transported to Highland District Hospital by Paint Creek. The police department said Dawson would likely not be cited since the accident happened on private property. At 9:03 a.m. Paint Creek responded to what was reported as a two-vehicle head-on accident on North Shore Drive at Robinhood Lane. Paint Creek Public Information Officer Branden Jackman said one victim was transported by helicopter to Miami Valley Hospital and another was transported by Paint Creek to Highland District Hospital.